Tom Landauer received his degree at Harvard University in 1960 and held positions at Harvard University, Dartmouth College, Stanford University, Princeton University, and University of Colorado. He also served as Executive Vice President of Research of Pearson Knowledge Technologies (PKT, formerly Knowledge Analysis Technologies), of which he was founding President in 1998. Tom was a Professor Emeritus of Psychology at the University of Colorado, Boulder, and a Fellow in their Institute of Cognitive Science. Tom was a Distinguished Member of Technical Staff at Bell Laboratories and its successors for 25 years. Tom and the group of computer scientists, linguists and cognitive psychologists he directed at Bell Labs, Bellcore, and then Telcordia conducted the fundamental and applied work that led to the theory, development and implementation of Latent Semantic Analysis (LSA). His company at PKT is applying LSA to automatic analysis of essays, cross-language information retrieval, and collaborative learning. His Intelligent Essay Assessor can grade many types of essays as accurately as human expert graders. He is first editor of the 2007 Handbook of Latent Semantic Analysis published by Lawrence Erlbaum. Tom has contributed to our understanding of broad issues and implications of human-computer interaction with many papers. 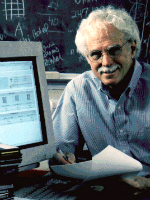 This includes his edited The Handbook of Human-Computer Interaction, and his 1995 book published by MIT Press, The Trouble with Computers: Usefulness, Usability, and Productivity, which explores the productivity paradox of computing and the way that HCI can make a difference. The book received the Association of American Publishers award for best Computer Science book of 1994. * The FABBS Foundation would like to thank Dr. Peter W. Foltz and Dr. Arthur Graesser for nominating Dr. Landauer for this honor and for leading the effort to spread the word about his nomination. Would you like to honor Dr. Landauer? It’s not too late to have your name added to the list of donors! You can make your donation to Dr. Landauer’s In Honor Of… campaign at anytime.